Last weekend Conor of ConorBofin.com and ‘the Wife’ visited for a great weekend of Food Blogging Without Boundaries. As you will notice, the pictures in this post and the next three are vastly superior to my usual point-and-click-and-hurry-to-get-back-to-the-cooking photographs. That’s because Conor took and processed them and kindly allowed me to use them in these posts. Not only does he have a much better camera, he also knows how to use it and how to make nice compositions. 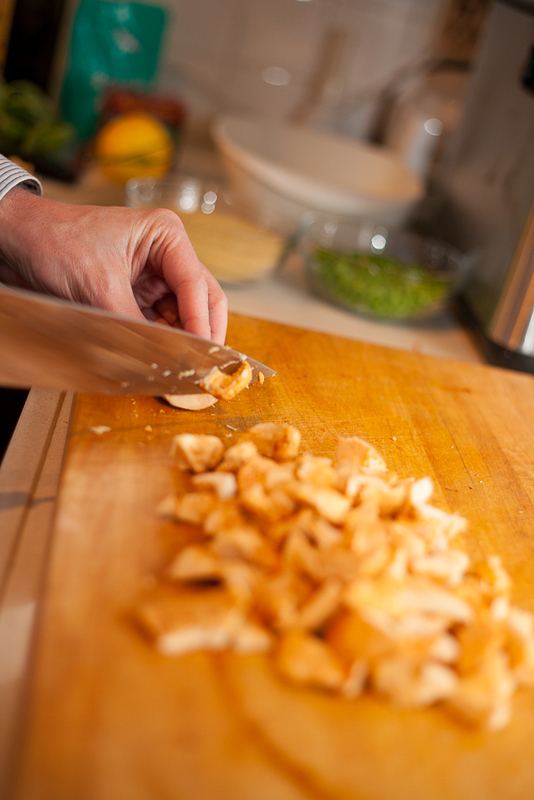 I am usually just worried whether I will be able to crop away how messy my kitchen really is while I am cooking. 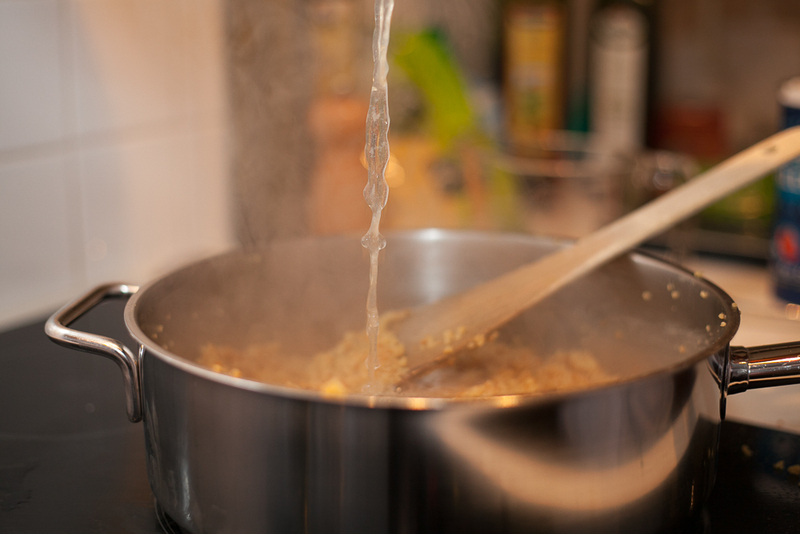 I would gladly offer Conor a position as resident photographer, not only for the outstanding pictures but also because I could then concentrate completely on the cooking and wouldn’t have to worry about cleaning my hands (and the camera) all the time. (Not to mention his great company.) It is also much easier to take pouring shots as you will notice. Other than usual I have included the pictures in high resolution, so you will actually get a bigger image when you click on them. Please enjoy Conor’s pictures while they last, because after some posts it will be back to my regular ones. We wished more of our blogging buddies could have joined us, but we tried to include them in spirit by cooking and eating their recipes. Since we’re both fans of Richard McGary’s blog, we browsed through his recipes to pick one we’d like to make. 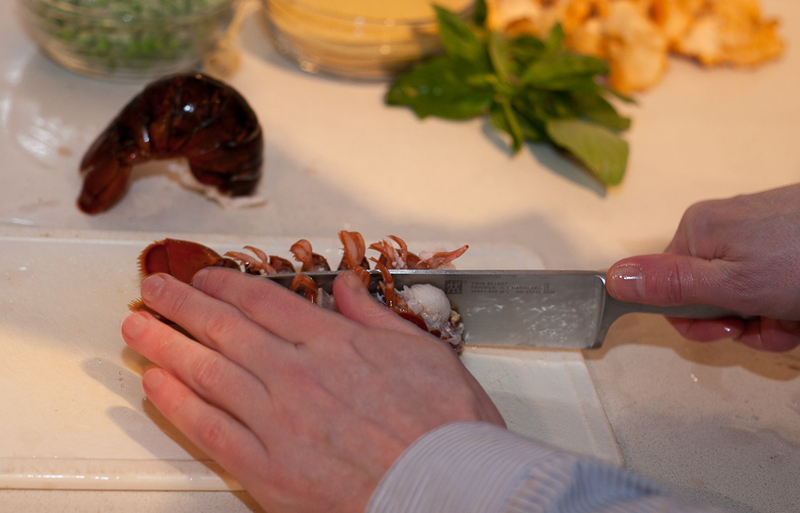 We decided on Butter Poached Lobster Tails as we wanted to taste the combination of lobster with coconut and lemon. It would also be a great match for the wonderful bottle of buttery oaky North Italian chardonnay I had picked out because I knew Conor would like it. 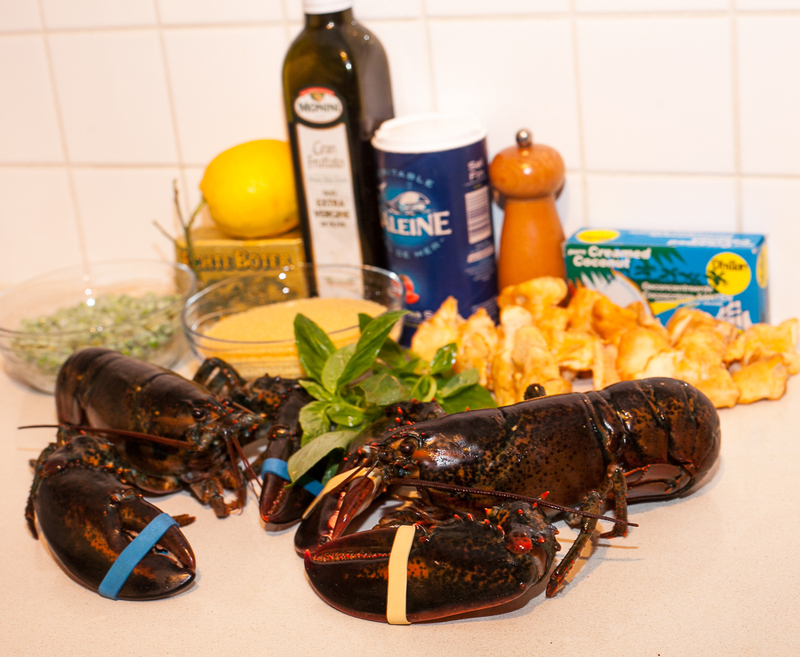 Poaching lobsters in beurre monté (an emulsion of butter) is a classic preparation that tastes really well, but for which incredible amounts of butter are needed. With sous-vide you only need a bit of butter to surround the lobster with butter. We really liked Richard’s idea of adding lemon and coconut to the beurre monté. There was just a hint of coconut, so I’ll try doubling the amount of coconut next time I make this. I took Conor and the wife shopping for live lobsters (as well as for sightseeing at the nearby Zaansche Schans — windmills, wooden shoes, cheese, and a very flat and green Dutch landscape). 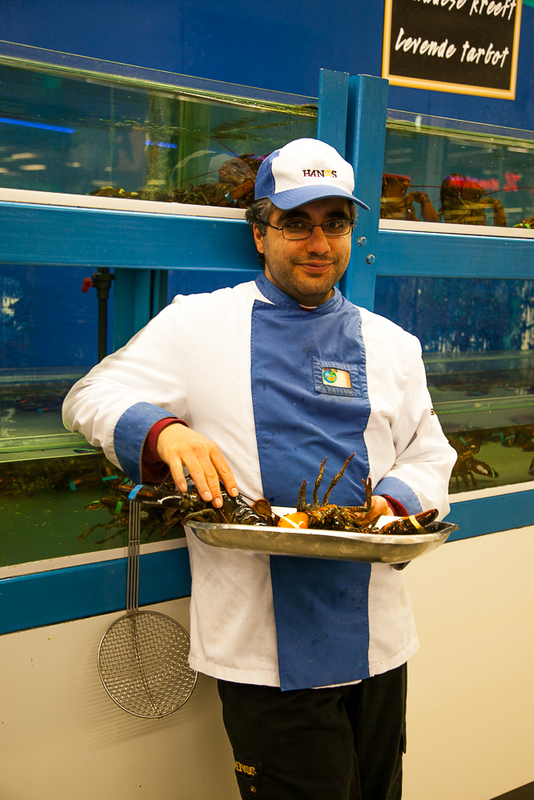 The salesperson was a good sport and posed for Conor’s camera, stroking one of the lobsters. When buying live lobsters, always make sure that they are struggling when taken out of the tank. If not, make sure to ask for another one! With the live lobsters we had meat from the claws and legs as well, which meant one lobster was enough for two. The trumpet mushrooms that Richard used didn’t look at all like the trumpet mushrooms we have around here (trumpet of the dead, black chanterelles) so we decided to go for pied de mouton (literally sheep’s feet in French, hedgehog mushrooms) because the sweet flavor would go nicely with the lobster. Richard uses “rich coconut milk” in his recipe, which is the part of the milk at the top of the can of coconut milk. I used “santen” instead, which is creamed coconut and means you won’t have a leftover can of skim coconut milk. We all loved this. 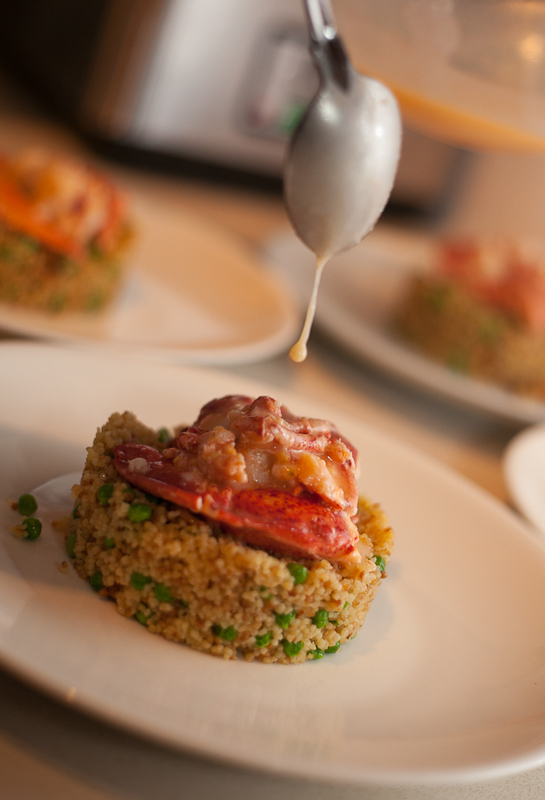 The couscous and lobster were great on their own, but the combination of flavors and textures (the tenderness of the lobster meat, the tanginess of the lemon, the velvety sauce with a hint of coconut, the sweetness of the mushrooms and peas, the crispy texture and wonderful lobster flavor of the couscous) became something really special. Here is our version of Richard’s wonderful dish, that I will definitely make again. 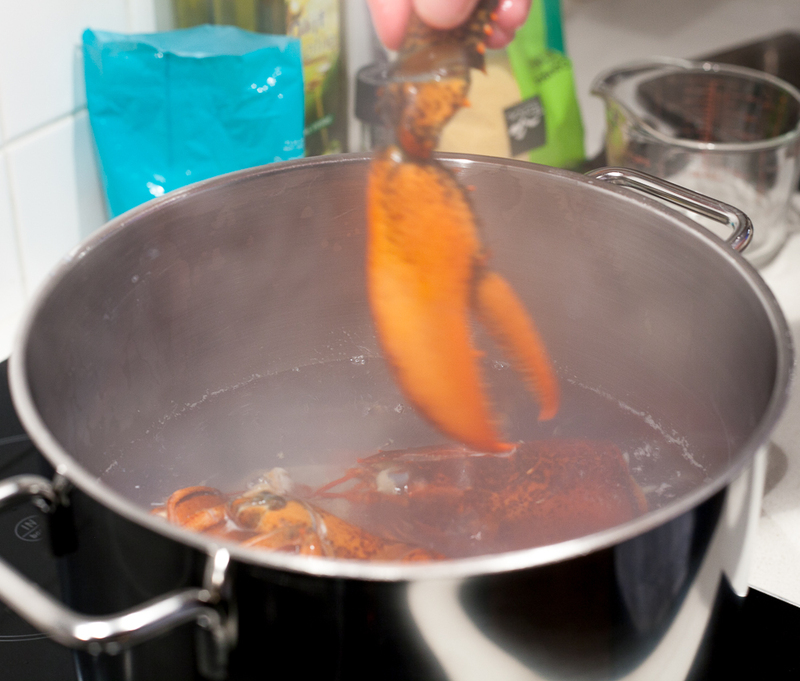 Put enough water in a large pot to be able to submerge both lobsters and bring this to a boil. 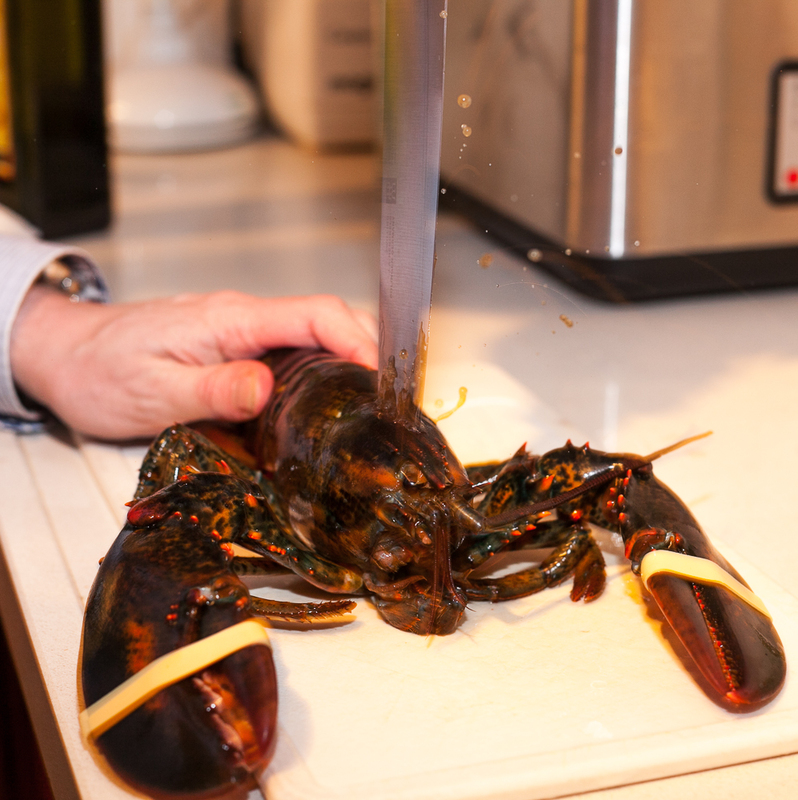 Although it is not as nice for us humans to perform this act, it is apparently nicer for the lobster to plunge a knife through its brain to kill it instantly before submerging it in boiling water. 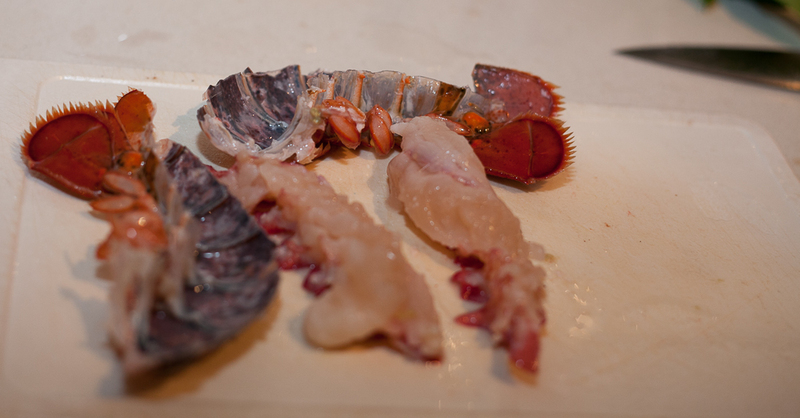 Divide the lobsters into tails, claws, legs, and bodies. This can be a bit creepy because although the lobsters are in fact dead, they will be spasming for a while. 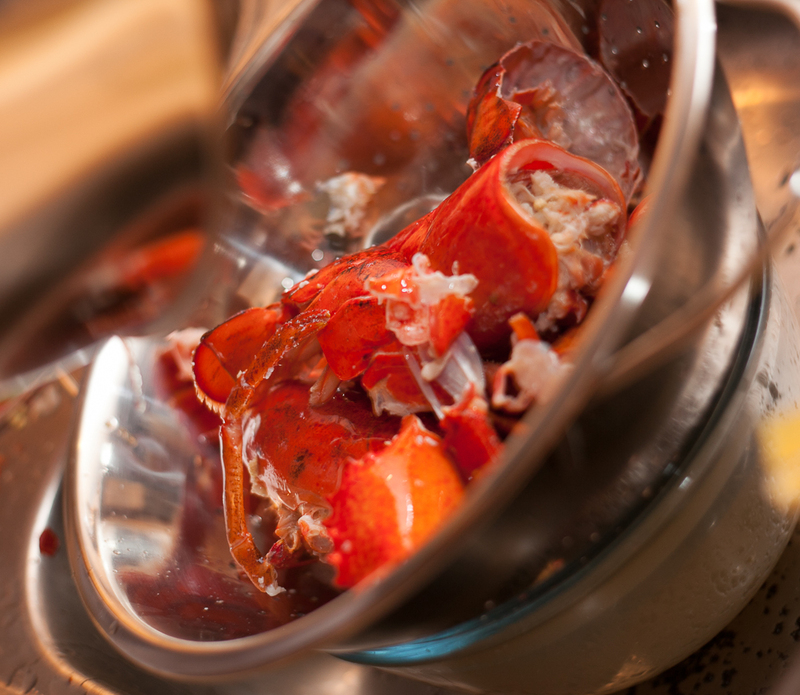 Add the lobster pieces to the boiling water and take off the heat. Allow the tails to steep for 2 minutes and then take them out. Allow the claws and legs to steep for 6 minutes. This steeping makes it easier to remove them from the shells. The lobster will be cooked sous-vide at 46C/115F which is the optimal temperature for the tails. The claws won’t set at this temperature, that is why they need to be steeped longer. With a chef’s knife cut the tails in half lengthwise. This makes it easy to remove the meat, and the tail will be used for two servings anyway. Take the meat out of the tails. It will be still raw at this point, but it should be easy to take it out with your fingers or a spoon. Throw the shells back into the pot with the heads. 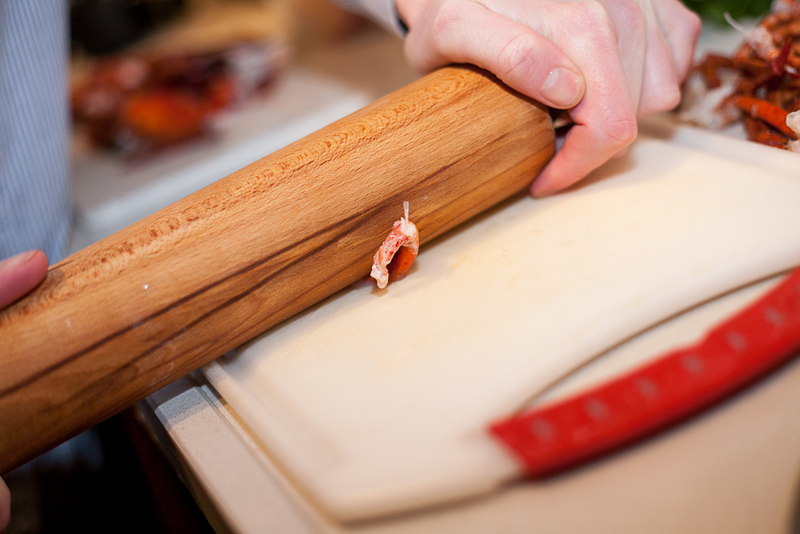 A great way to get the meat out of the legs is by using a rolling pin. Make sure that the end of the leg is open, otherwise the meat can’t come out. Throw the shells of the legs back into the pot. 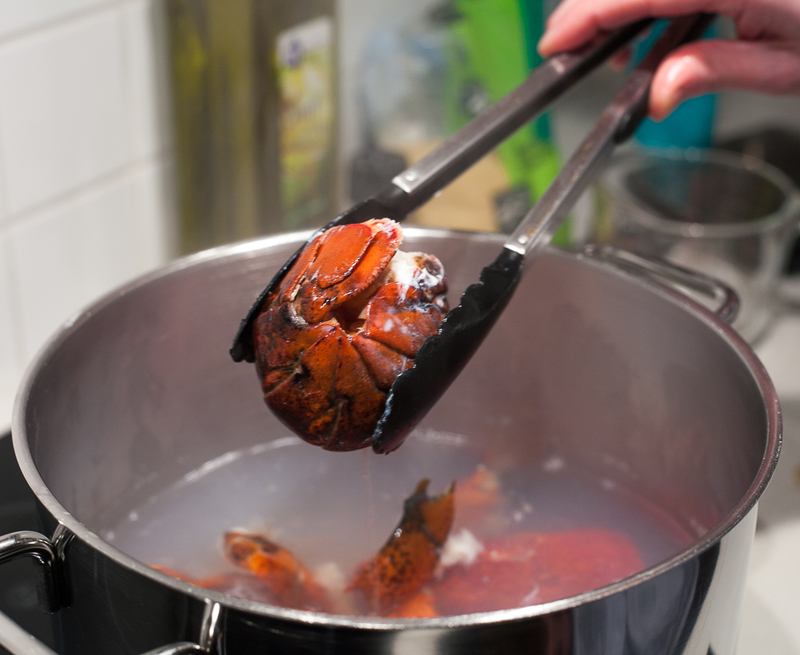 Take the meat out of the claws as well and again throw the claw shells into the pot. 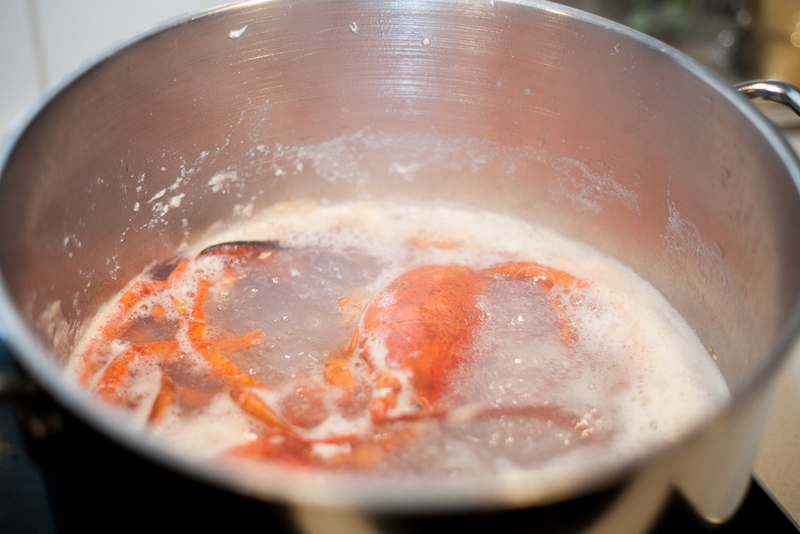 Simmer the lobster shells in the pot for at least an hour to make lobster stock to cook the cous cous. …reserving the stock and discarding the shells. Sieve the lobster stock with a fine sieve to remove the smaller particles as well. 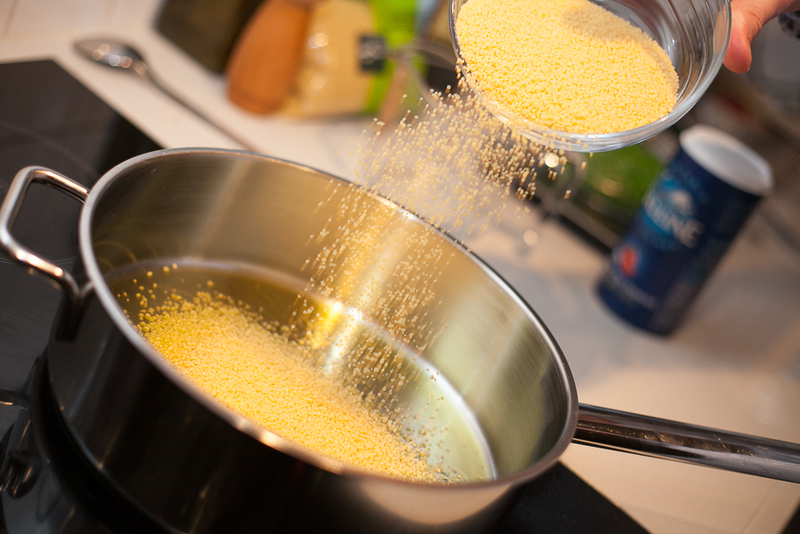 If you have more lobster stock than you need to cook the couscous, simmer it down some more to concentrate the wonderful lobster flavor as much as possible. Cut them in 1 cm (1/2 inch) dice. 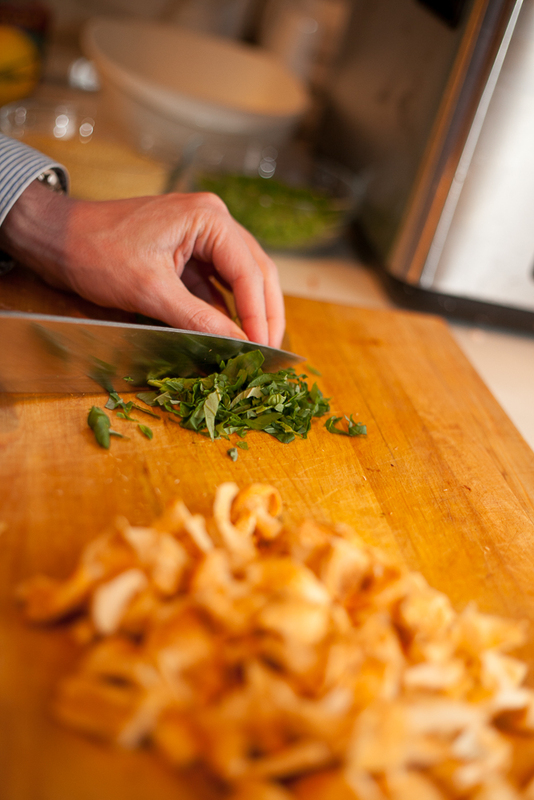 Cut enough basil leaves with a sharp knife to obtain about two tablespoons of basil strips. Try to bruise the leaves as little as possible. Basil is not chopped because then it would release its wonderful aroma prematurely. Zest the lemon. 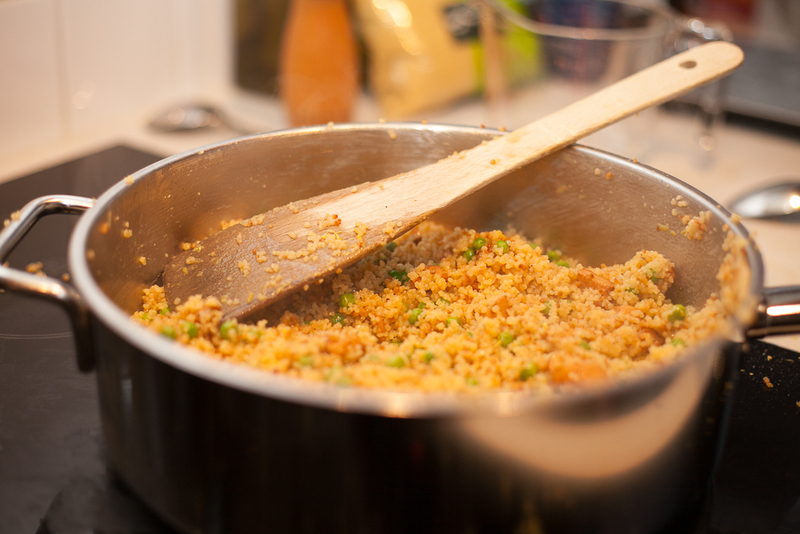 Put half of the zest in a saucepan and reserve the other half for the couscous. 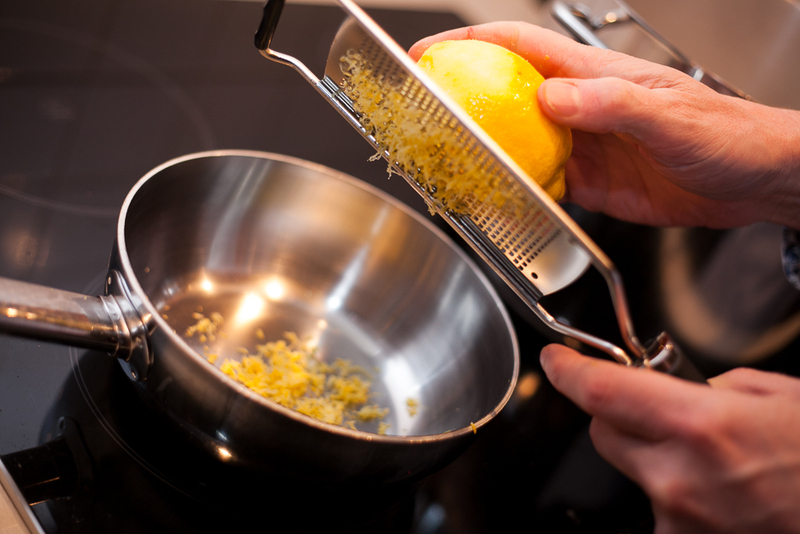 Juice the lemon into the same saucepan. 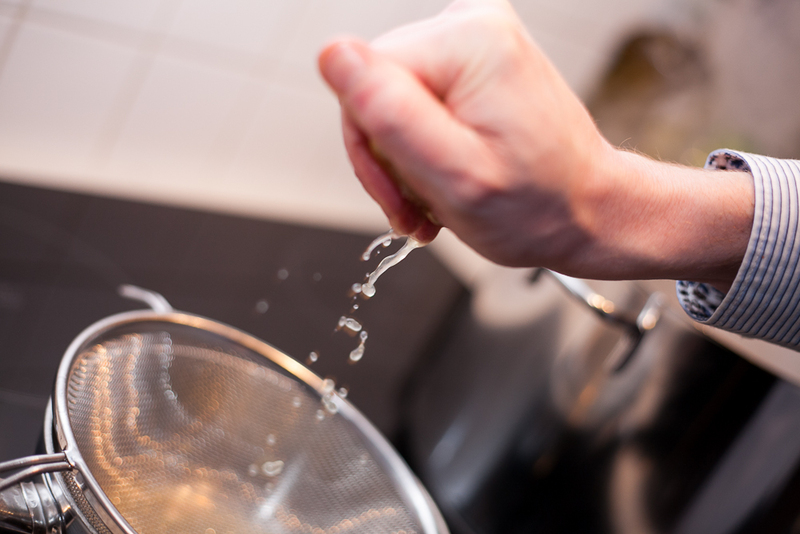 It is a good idea to use a sieve, so you won’t have to fish out the pits. Add the creamed coconut, crumbled. 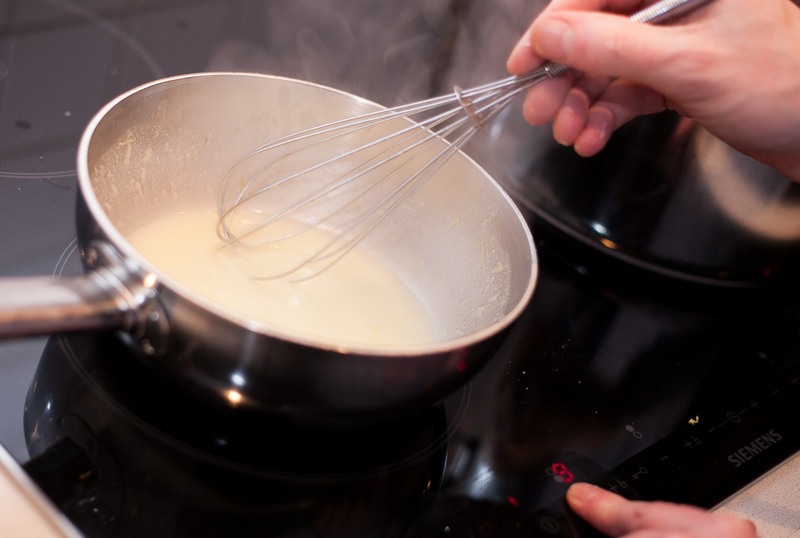 Heat over medium low heat and whisk until the creamed coconut has dissolved. 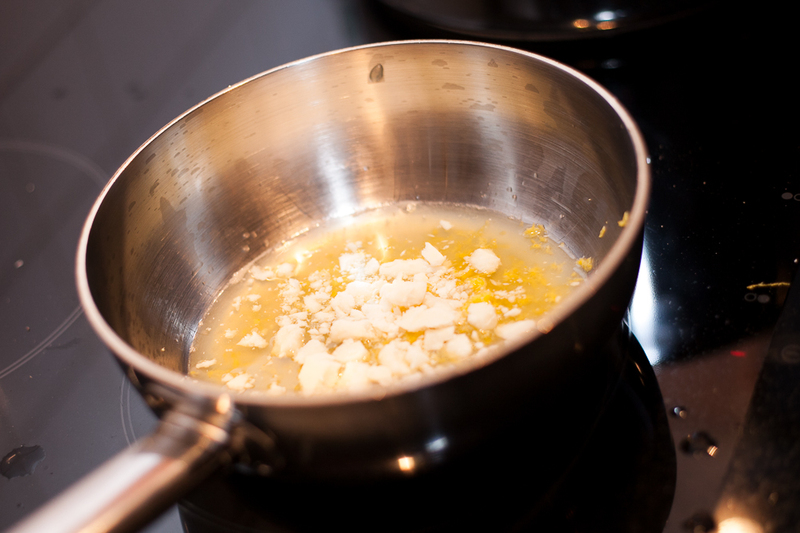 Then take off the heat and add the butter little by little, whisking constantly, to make beurre monté. You do not want the butter to separate. The beurre monté will become nice and thick. 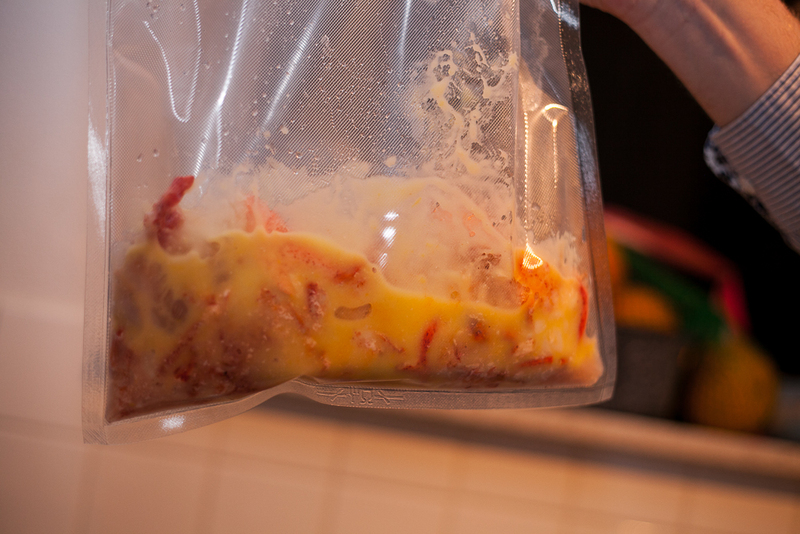 Put the lobster meat in a ziploc pouch and pour the beurre monté into the bag. 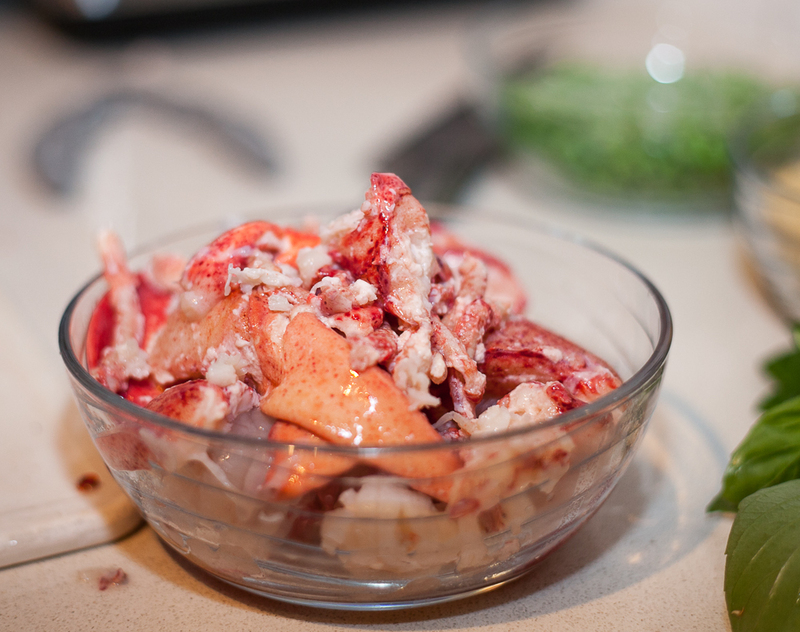 Make sure the beurre monté is distributed evenly around the lobster meat in the bag. 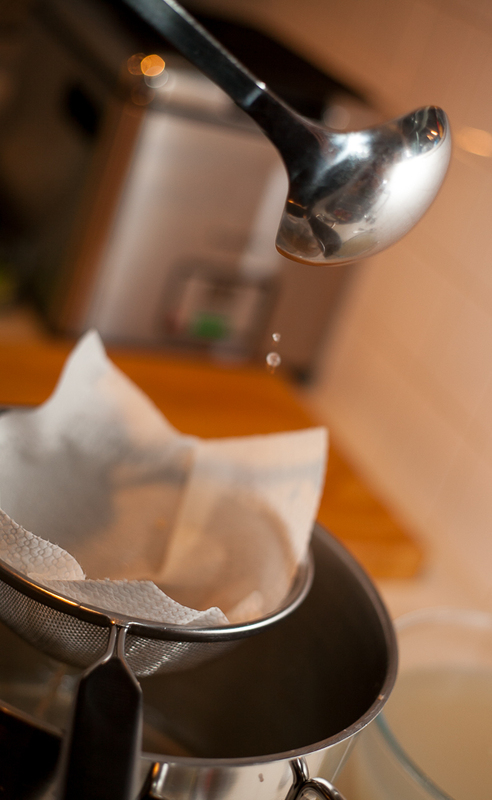 Submerge the bag into a waterbath heated to 46C/115F, sealing it with as little air in the bag as possible. 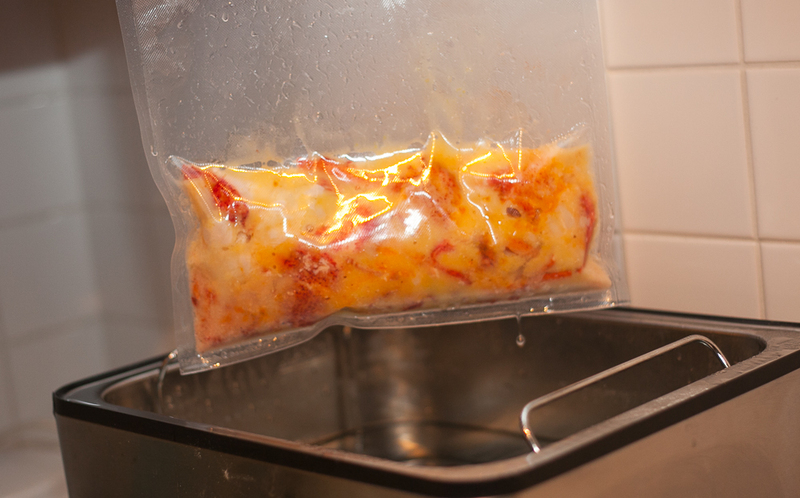 Cook sous-vide for about 45 minutes. 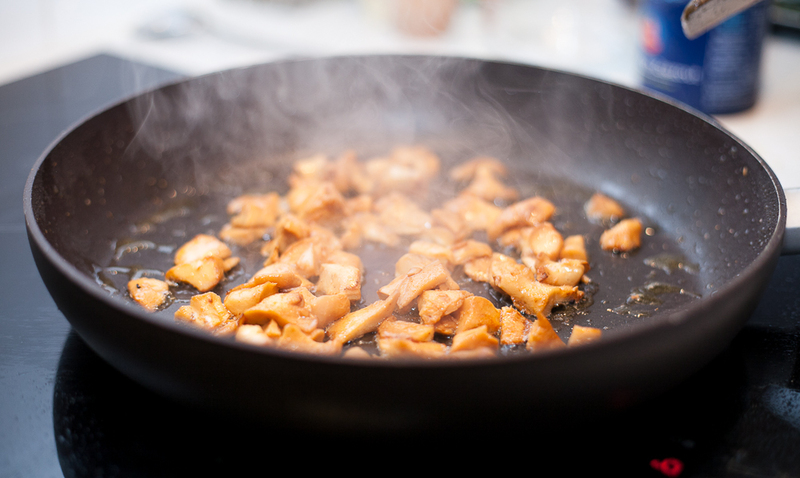 Meanwhile, sauté the mushrooms in butter over medium high heat. 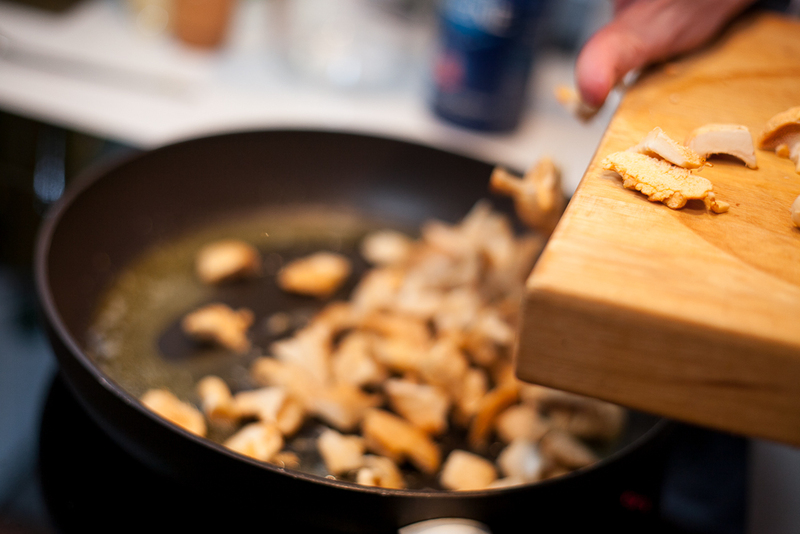 The mushrooms will first absorb all the butter. When they start giving it up again, sauté for a few minutes longer until golden. Season with salt and freshly ground black pepper. 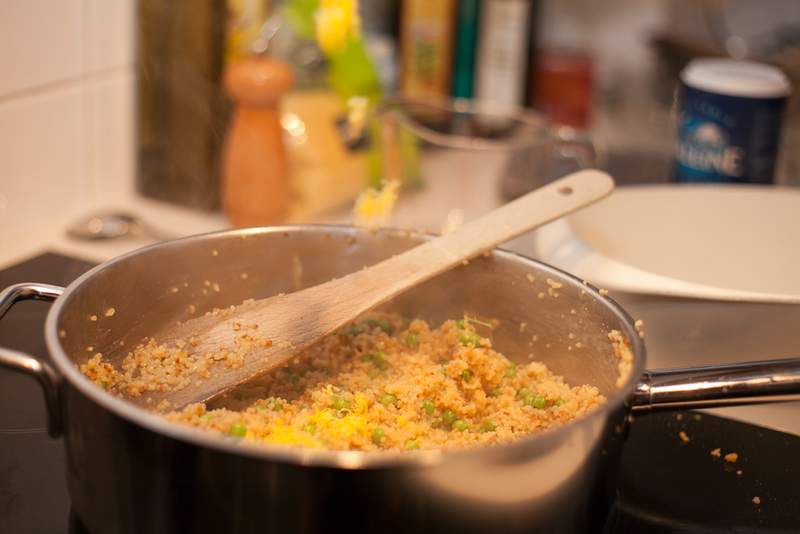 Heat olive oil in a frying pan and add the couscous. Toast for about 5 minutes, stirring, until the couscous is golden. Add some lobster stock to the couscous and stir. 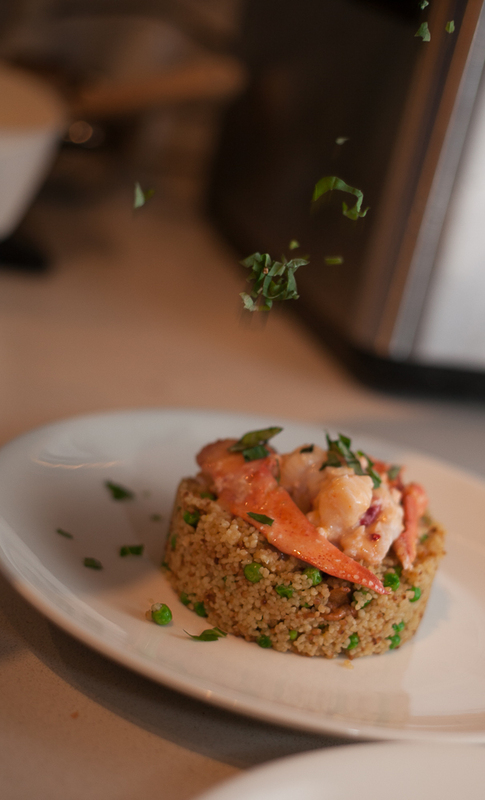 Keep adding lobster stock and stirring until the couscous is cooked, about 10 minutes. Stir until well mixed. Taste and adjust the seasoning. 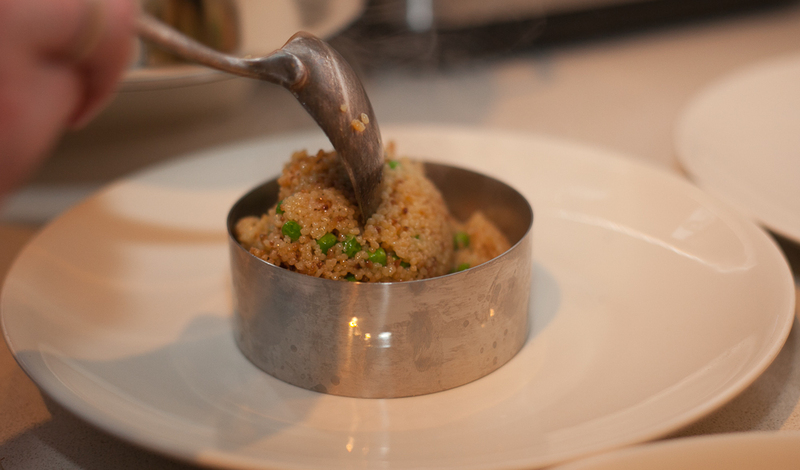 When the lobster has finished cooking sous-vide, arrange the couscous on warm plates using a ring mold. Take the lobster out of the water bath. 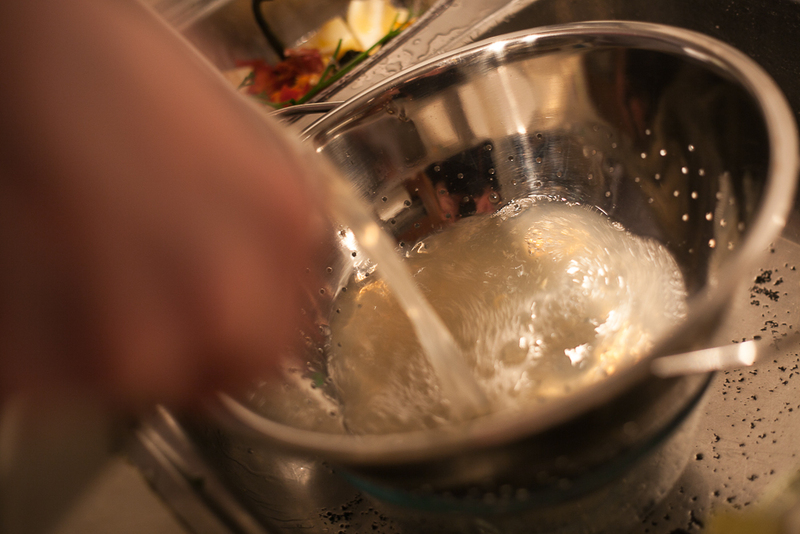 Pour the beurre monté into a warm bowl (so it won’t cool off too much). 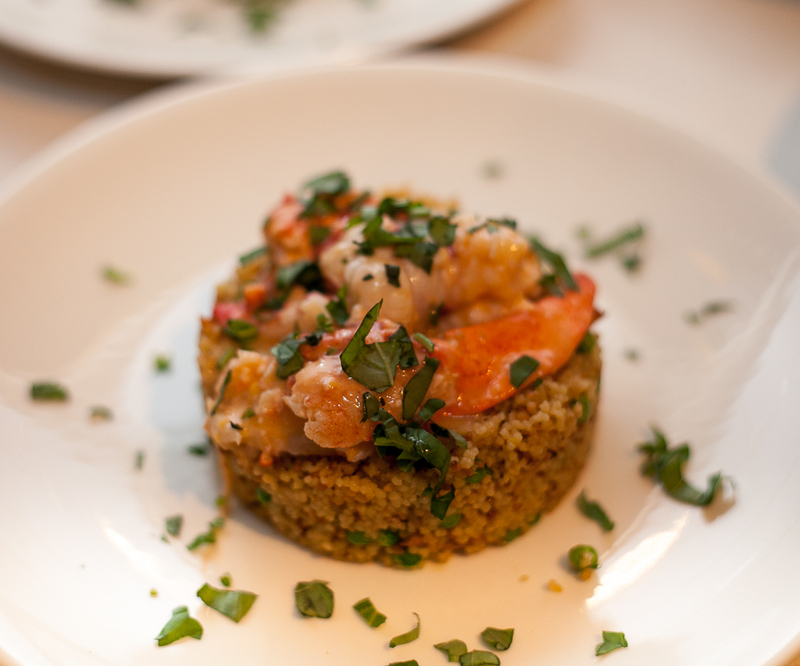 Arrange the lobster meat on top of the couscous. Top with the beurre monté as a sauce. Butter-poached lobster and oaked buttery chardonnay are friends. We had a wonderful 2008 “Cuvée Bois” from Les Crêtes in Valle d’Aosta (northwest Italy near the Mont Blanc, they speak French there). It has a perfect balance between ripe tropical fruit, good acidity and minerality, butteriness, and oakiness. What a great wine! That’s a pretty accurate summary of that course Stefan. What you can not convey is the truly incredible flavours and perfect wine paring that went on on the night. At the risk of over inflating your ego, thanks again! Thanks Conor. Unfortunately there is no HTML code to convey flavors, smells, and textures. The photos do a pretty good job though. Great recipe and GORGEOUS shots!!! Thanks Stéphane! I knew you’d enjoy Conor’s photography. Hi, Stefan. Thanks for the shout-out. I am incredibly honored that you and Conor decided to choose a recipe off our blog to try. There are so many good food blogs out there to choose from. I’m also pleased you liked the recipe. It is incredibly flavorful yet very delicate, almost decadent. I need to try it at 115 C next time to see the difference in texture and flavor, as well as the cream of coconut as opposed to the rich coconut milk. I also loved the fast action nature of Conor’s Canon MK5 II camera. The kill shot with the juice flying in the air is pretty amazing. Baby Lady will be jealous of the quality of the photo (not necessarily the kill itself). Last, I really I like the use of the ring mold for service. Very nice presentation, elegant, in fact. Thanks again for the mention and use of the recipe. Best post I’ve read in ages – Conor really is a supreme photographer. And I know his secret (in part) Its got something to do with the flash on his camera; I saw it on an earlier post – its big and its fancy. I have no real idea whether this is how he does it – but the pics are indeed impressive. Divine. No other way to describe this recipe, thanks! Thanks for stopping by and leaving such a nice compliment. Wat een fijne blog met een veel inspiratie en transpiratie natuurlijk. De kippen heb ik inmiddels gevonden. Een vraagje: waar zijn de ziplog zakken die je gebruikt te bestellen? Dank voor je reactie. Ben benieuwd wat je vindt van de kip. Ik heb de zip pouches rechtstreeks besteld bij http://www.sousvidesupreme.com/ (je kunt niet zomaar zakken met een ziploc gebruiken, ze moeten geschikt zijn om in te koken). Ik heb nog geen (web)winkel in Nederland gevonden die ze verkoopt. The recipe looks wonderful and the action shots are amazing. 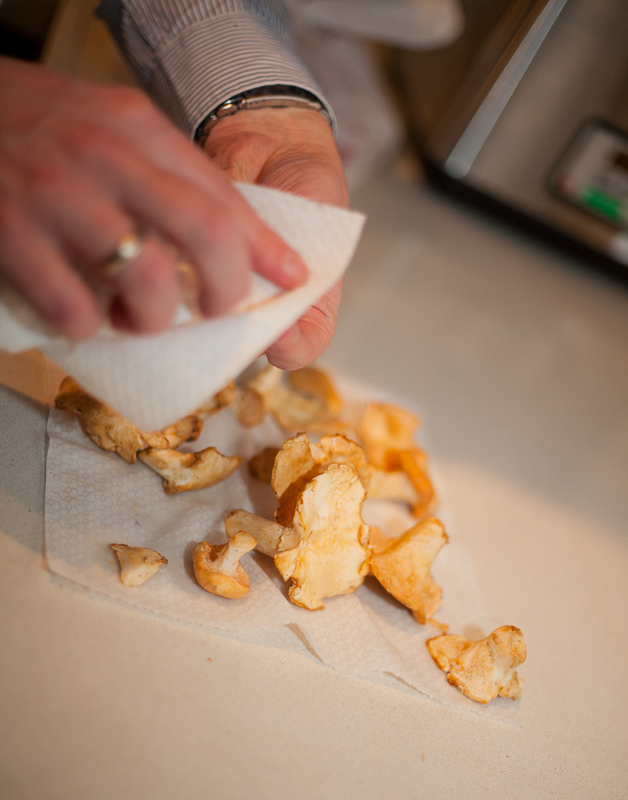 Wouldn’t it be nice to have a photographer to follow you around in the kitchen for each post? The action shots really add a lot to the recipe but it is so hard to get them when you cook alone. Anyway, great post! Thanks, and it definitely would be nice! I’ve come here from Conor’s blog and I have to admit, suddenly I’ve a craving for lobster. Go figure! That lobster was so wonderfully prepared and presented, Stefan. I’m glad to read that you all had such a great time together. Thanks for the very nice compliment. I used Richard’s recipe, so he deserves most of the credit. Thanks for leaving such a nice comment! I am going to try this recipe for Valentines day. How was the texture and did it taste “cooked” at 115? I am debating between 115 and 140. 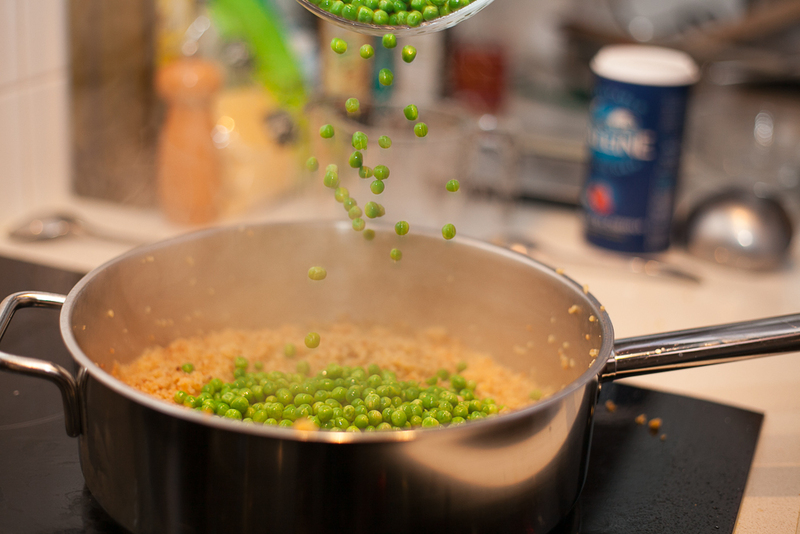 Use 140 degrees if you want the taste and texture to be like what you are used to from a restaurant. At 115 degrees the medium can be considered ‘medium rare’ and is more tender and juicy. This also depends on the type and quality of the lobster. As a general advice, if you are cooking for a special occasion it is always smart to experiment in advance. 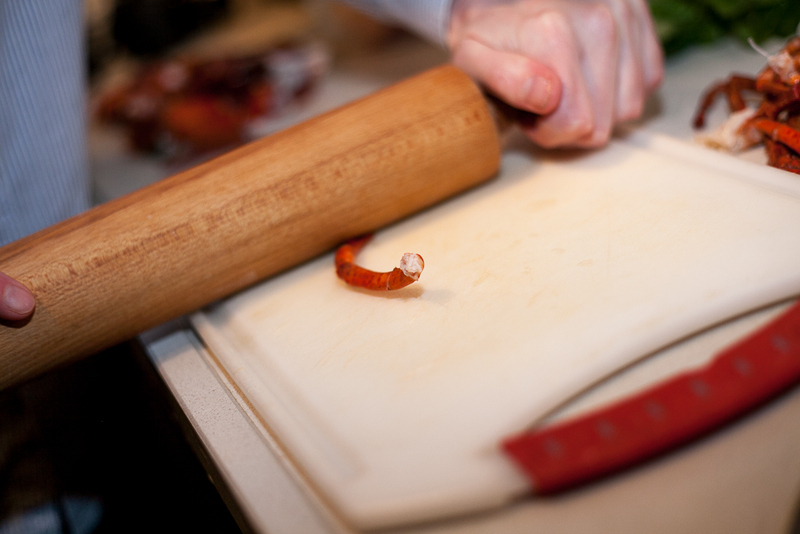 What a knock-out dish and what a great tip for using a rolling pin to get the leg meat. Gorgeous pictures, Conor. I’m very envious of both the food and the photography. Made this perfect way of preparing lobster for the second time. As I had to serve 7 courses at night, I prepared as much as possible in advance. So also the lobster in the afternoon. 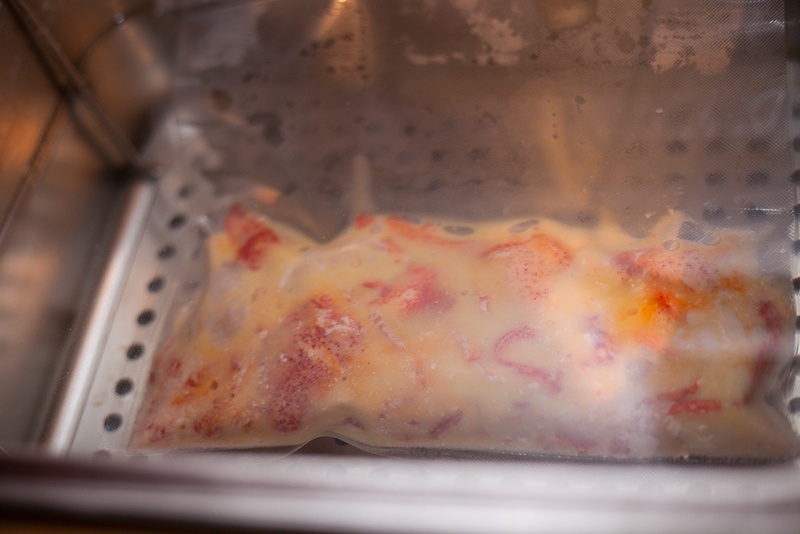 The first time I prepared the lobster bag close to the sous vide process. Now I prepared the bag and after vacuuming I put it in the fridge. When eating the lobster was OK, but not as fantastic and surprising as the first time. My theory is that probably the lemon juice already started the “cooking” process of the lobster, like ceviche? I think you are right about the lemon juice. Apart from that, it is also true that lobster is best when it’s fresh, so the shorter the time between killing the lobster and eating, the better. 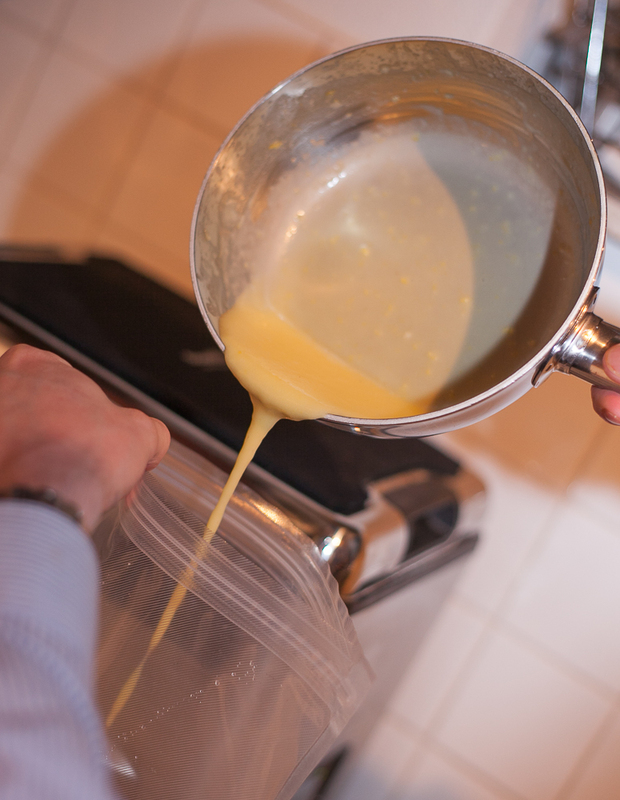 As a workaround, you could add the lemon juice to the sauce after the cooking. The flavour combination of this recipe is really great! I’d like to try it for the third time coming weekend. But now I was thinking of using langoustines instead of lobster. And of course about timing and temperature? Great to hear you like this. I haven’t made this in ages, and I should make it again as it is a great dish. I’ve never done langoustines sous vide. Their texture is quite different and I would recommend a very hot very short dear so they are still raw inside (Librije style; they use a blowtorch for it). I have never done them sous vide. You could definitely make a stock from the shells and heads and use them for this recipe — just remember to crack the claws before they go into the stockpot to extract the flavor from there as well. What wine pairing are you doing? I bet a white Rioja (oaked!) would work really well. That’s exactly how I prepared them before, torch them! Probably the best way, your right about the delicacy. Should I oil or butter them before? I loved your coconut/butter flavour most, a so unexpected combination. Great together with the mushrooms and basil! I made it without the couscous, but only a few tagliatelle strings with a hint of truffle oil. About the wine; definitely oaked. I still have to choose, either the Bernardus Chardonnay ‘16 or a great Limoux ‘17 called Mas de Mas (found affordable at Hanos) from Jean Claude Mas.